You’ll never be too lazy to cleanse your skin again! As much as we long for clean, flawless skin all over, there are days when we just get really lazy. Who has time to complete a 10-step skincare regimen when your bed just looks so inviting anyway? 1. Go gentle on your eye area. The skin around your eyes is ten times thinner than the skin on the rest of your face, making it extra prone to signs of aging. Pulling, rubbing, and tugging on the skin around your eyes can make your eyes puffy, and your crow’s feet, and dark circles worse. When cleansing your eye area, gently press on the skin with a cotton pad to take off stubborn mascara and eyeliner. 2. Ice is your new best friend. Use it to prime your face before applying make-up, as well as to end your cleansing routine to seal your pores. Ice also promotes blood circulation and relieves puffiness, and the best part is that you don’t have to spend anything to get it! What more could you ask for? 3. Avoid harsh skincare products. The products you use to clean your face matter way more than you think! Cleansers and astringents should leave your face feeling soft and moisturized, not dry and tight. If washing your face leaves your cheeks feeling super dry, that’s not a good sign. A mild yet effective cleanser like micellar water should be able to maintain your skin’s balance without making your concerns worse. If you think washing your face every three hours with will get rid of the oil on your T-zone, think again. Over-washing can strip your skin of its natural oils, and your oil glands will end up compensating by producing more sebum. All this extra oil will only result in larger pores, nasty breakouts, and an even shinier nose. Yikes! 5. Clean your makeup brushes too. Clean your makeup brushes and sponges regularly to prevent transferring germs to your face—you can squeeze this in during your nightly cleansing routine by pouring micellar water in a small cup and swirling your brushes in it. 6. Keep micellar water on your nightstand. Micellar water is a high-performing gentle cleanser that removes all your makeup and leaves your skin perfectly clean, soft, smooth, and hydrated. It’s alcohol-free, fragrance-free, hypoallergenic and has skin-loving ingredients, which makes it suitable for all skin types. It’s pretty much a dream come true for all lazy girls! Keep a bottle of L’Oreal Paris Micellar Water by your bed so you’ll never have a reason to not remove your makeup! You don’t even need to wash it off, so it’s especially perfect for those days when you’re just too tamad to remove your makeup before crashing into bed. And really, more sleep is the ultimate skin care hack, isn’t it? L’Oreal Paris Micellar Water is super affordable at only P225 for a 250 mL bottle. Drop by your nearest Watsons store and look for L’Oreal Paris counters to try it today! 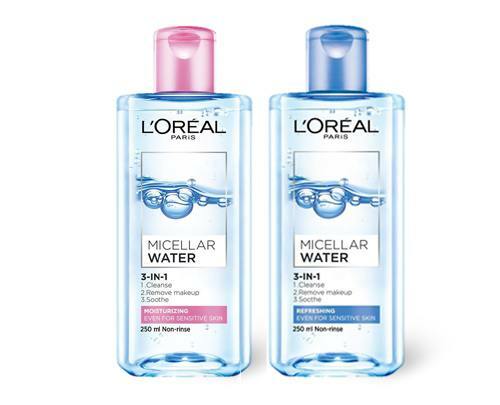 Learn more about L’Oreal Micellar Water here. This article was created by Summit Storylabs in partnership with L'Oreal Micellar Water.